Minerals are the inorganic elements which comprise part of the body. They contribute from 60% to 80% of all the inorganic material in the human body. The trace elements make up the remainder. Minerals and trace elements serve as vital catalysts for the biological reactions that take place within the body. They are found, for example, in bones, teeth, and soft tissues. They are needed for the production of blood, hormones, and enzymes, thus serving a life-sustaining function. The absorption of minerals and trace elements (excluding electrolytes) is generally less efficient than that of other nutrients. The term “bioavailability” refers to the degree to which a particular nutrient is available for use in the body. There are many factors which influence bioavailability, including the compound form of the mineral or trace element. Iron acts with protein and copper to make hemoglobin, the oxygen-carrying component of red blood cells. 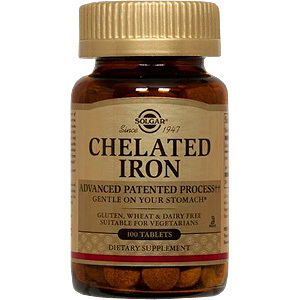 Solgar's Chelated Iron Tablets are free of corn, yeast, wheat, soy and dairy products and are formulated without the use of preservatives, artificial flavors or colors. *Solgar's Chelated Copper Tablets are manufactured under license agreements with Albion Laboratories whose patents and pending patents cover the complexing of minerals with pure amino acids. † Fully reacted chelates, Albion process patent No. 4,599, 152 Chelazomes. Other Ingredients: Dicalcium Phosphate, Microcrystalline Cellulose, Vegetable Cellulose, Vegetable Stearic Acid, Vegetable Magnesium Stearate, Vegetable Glycerin, Carnauba Wax. 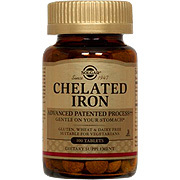 Chelated Iron is shipped in a discrete, unmarked package. Orders are processed immediately and usually take about 3 to 5 working days to be received. We do ask that you try it for 2 to 3 weeks to feel the full effects. Any information received is used only for order processing and shipping purposes. Your information, such as e-mail address, will never be disclosed to a third party.